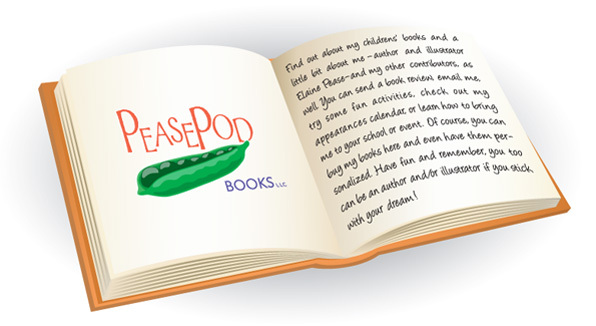 PeasePod Books, LLC is the pod where author Elaine Pease writes picture books and middle grade novels. Elaine's titles include I'll Never Leave, Even Sharks Need Friends, middle grade history mystery and Tallie's Christmas Light Surprise! A Holiday Whodunit, Pelican Publishing. Along with her writing and illustrating, she loves to inspire children by visiting schools with her exciting power point presentations. Who stole Tallie's sparkly, special candy cane Christmas lights? Was it the mailman, a snake, or maybe a baby reindeer? You're in for a big surprise! 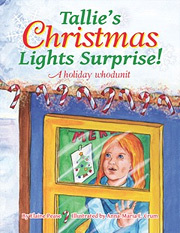 "Tallie's Christmas Light Surprise is a delightful romp of a whodunit. Tallie's wonder and exuberance bubble up fresh on every page as she tracks down her missing Christmas lights. The yummy surprise ending leaves you with a warm and wonderful feeling of Christmas." –Kerry Lee MacLean, author of Peaceful Piggy Meditation, Moody Cow Meditates, and now, Moody Cow Learns Compassion. Click this button to purchase a signed copy of Tallie’s Christmas Lights Surprise!-hardcover from PeasePod Books for $16.95 (does not include shipping). If you would like to order more than 1 book, you may specify quantity on the checkout screen. *Be sure to specify any inscription requests in the Special Instructions field on the checkout screen. Click this button to purchase a signed copy of I'll Never Leave from PeasePod Books for $14.95 (does not include shipping). If you would like to order more than 1 book, you may specify quantity on the checkout screen. Click this button to purchase a signed copy of Even Sharks Need Friends from PeasePod Books for $15.95 (does not include shipping). If you would like to order more than 1 book, you may specify quantity on the checkout screen. Her debut chapter book captures Elaine’s passion for western history. 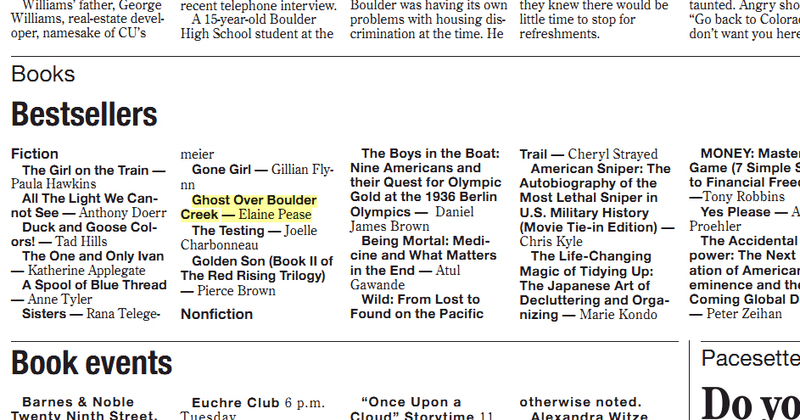 Ghost Over Boulder Creek, a history/mystery book, brings it to life for readers ages eight to twelve. See glossary of Native American and historical terms used in book. Click this button to purchase a signed copy of Ghost Over Boulder Creek- HARDCOVER from PeasePod Books for $15.95 (does not include shipping). If you would like to order more than 1 book, you may specify quantity on the checkout screen. Click this button to purchase a signed copy of Ghost Over Boulder Creek- PAPERBACK from PeasePod Books for $8.95 (does not include shipping). If you would like to order more than 1 book, you may specify quantity on the checkout screen. Run Through Fire was a half-white and half Cheyenne twelve-year-old. He was the only one of his tribe who hadn't yet killed a buffalo. Until he did this one task he would not be looked upon as a hunter or warrior. Determined to succeed, he sets out on his own. One night on his hunt he was surprised when a spirit visited him and took him back to the time of the Sand Creek Massacre. He had survived along with others of his tribe. The spirit tells him that he is destined to survive another attack. Run Through Fire's entire tribe was later captured by General Custer's men. As a result, Run Through Fire was forced to say good-bye to his mother and the other survivors of his tribe to go on a journey with Buffalo Bill to Fort Dodge. Run Through Fire's only thought was to escape to freedom. He would find just the right moment to escape, to blend in, especially since he could pass for white. Once he acquired his freedom he would return to his land and free his people. Run Through Fire would begin his long journey to becoming a man. Pease has done an excellent job of bringing true life events from the late 1800's to life. Young readers will recognize familiar historical people such as General Custer, and Buffalo Bill. Boys and girls alike will want to read up on The Washita River Massacre and Sand Creek Massacre, to learn more details about these true events. Pease adds a fictitious character, Run Through Fire, to engage readers and to give them a special person they can relate to and cheer for. This easy to read tale would be an excellent addition for any home library or classroom. “Indian lore, a dangerous journey, a brave young Indian, a plucky girl who will risk all to help her friend, a great mystery and a ghost story await the young reader who opens the pages of Elaine Pease’s debut novel, Ghost Over Boulder Creek. Run Through Fire is a twelve-year-old Cheyenne brave who has seen a lot in his twelve winters. The child of a Cheyenne mother, Smiling Moon, and a white father, William Tull, the boy considers himself a Cheyenne and lives among his mother’s people in Oklahoma. His father used to visit as much as he could while working as a ranch hand in far away Colorado until the day he was taken away by white men who accused him of being a horse thief. Run Through Fire never saw his father again, although he hoped to one day travel to Colorado to learn his fate. While making camp along the Washita River, Run Through Fire’s people are attacked by the soldiers of the U.S. 7th Calvary. Most of the braves are killed and the women and children taken prisoner. Run Through Fire is brought, with his mother, to the 7th Calvary’s camp. It is here that General Custer sees the boy and decides that, given his light brown hair and blue eyes, he must be a white child who was captured many years ago. The boy is separated from his mother and soon finds himself traveling with Buffalo Bill to Fort Lyon in Colorado to find William Tull. The journey to Colorado is fraught with danger. Young Run Through Fire must use his wits and training as an Indian brave to survive dangers that include frozen rivers and attacking Indians. Along the way, he decides it might be to his advantage to take on the guise of his white relatives and so he begins to dress as a white boy and call himself Billy Tull. While Billy’s capture and subsequent journey to Colorado comprise about half of the story, the book takes an interesting turn when the young Indian arrives in Boulder. It is here that he meets his soon-to-be-best friend Rebecca Conner. It is also where the mystery really takes hold and best of all, where Billy meets the ghost. Without giving away the ending, the adventures Billy has with Rebecca are some of the best action scenes in the book and the story really takes a surprising turn that I suspect few readers will see coming. Ghost Over Boulder Creek deals with some important issues, namely the mistreatment of Native Americans by the ever-increasing populations of white men. Through Run Through Fire’s eyes, the reader will experience the joy and frustration of a buffalo hunt, and then see how soldiers, having no respect for the land or animals, slaughter them by the thousands. The conversations that Run Through Fire and Buffalo Bill have are quite interesting, particularly because young readers will be able to see how two people, born of different worlds, interpret the same events. Run Through Fire at first hates this famous cowboy who has been charged with his protection but after several talks, as they make their way through snow-laden fields, the relationship slowly evolves and both man and boy grow in their understanding of the other. Billy and Rebecca are the other highlight of this book. They are an unlikely pair, a lost Indian boy and a plucky girl with a fairly stable home life, living with her father and attending school. But the duo works well and young readers should really enjoy helping the two solve the great mystery behind Billy’s father and the ghost. Is there really a ghost? While readers will pick up this book to read the ghost story, for parents, the enticing aspect is that it is, in essence, a history lesson cleverly disguised as a wonderful adventure story. The author introduces many historical figures, from General Custer to Chief Black Kettle, along with actual events such as the Washita River Massacre that happened during the time of Billy’s travels. 2011 EVVY Award Winner for Juvenile Fiction and Cover Design. An exciting middle grade history/mystery that follows half-Cheyenne, half-white boy, Run Through Fire on his journey with Buffalo Bill to find his father. But ghostly images haunt him and Run Through fears for his life. An excellent choice for the social studies curriculum. Judge's comments: "Wow. What an incredible book to read. I cannot imagine the amount of research that went into this story. I love the historical facts and details, the characters, the integration of the language, and the authenticity of the voice. The language is beautiful-- even when describing a chamber pot--how vivid and clear. It is so well-written...I wish you the best of luck with this fabulous book. I am sure it will be a big success." Book description: Meet Hammy, a big, food loving hammerhead shark who needs a friend, in this light-hearted and funny tale. The other hammeheads bully him. He tries to fit in with a band of hammerheads called Swimmy Buffet and The Coral Waver Band, a "watered-down" version of the Jimmy Buffet band. Hammy finally learns something special when a little sea urchin tries hard to be his friend; good friends come in all sizes! Book description: Little Leaf loves staying on Mother tree throughout the seasons and won't leave when fall arrives. A sweet tale about bravery and the seasons of life. Fun facts on leaves in the back and crafts and activities. Find hiding ladybugs! *See link below for Upcoming Events! Check out this review of Safe at Last. 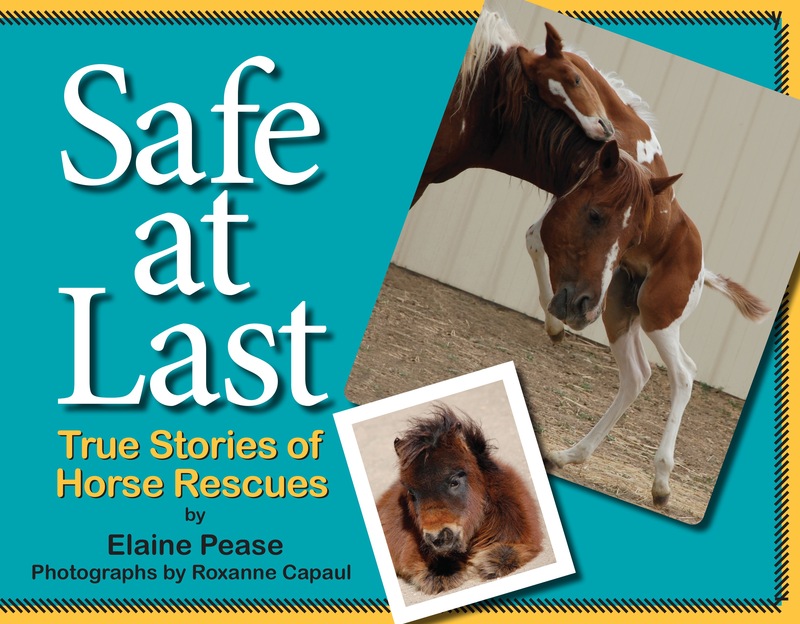 True Stories of Horse Rescues. Mysterious holiday picture book! Click here to watch the trailer on YouTube. Who stole Tallie's sparkly, special candy cane Christmas lights? Was it the mailman, a snake, or maybe a baby rendeer? You're in for a big surprise! --Kerry Lee MacLean, author of Peaceful Piggy Meditation, Moody Cow Meditates, and now, Moody Cow Learns Compassion. December 26, National Candy Cane Day!! CLICK ON "EVENTS" IN LEFT COLUMN FOR COMPLETE LIST. I just wanted to let you know my boys and I found "Tallie's Christmas Lights Surprise" at the Longmont library, and we read it together tonight. They loved it! My 8 year old liked your use of similes and descriptions. : )...my boys were entranced by your story, and it really held their attention. They have asked to read it several times!